This brief on ways to support fragile and conflict-affected states (FCS) in fostering private sector development is based on an in-depth assessment of strategies and assistance programs by the Independent Evaluation Group (IEG) entitled, World Bank Group Assistance to Low-Income Fragile and Conflict-Affected States: An Independent Evaluation. The evaluation presents empirical evidence from three country program evaluations; six case studies; portfolio analyses; human resources and budget data; secondary analysis of IEG evaluations; background studies on aid flows, gender, private sector development, and jobs; and surveys of Bank Group staff and stakeholders. In countries plagued by violence and conflict, security risks and instability as well as lack of infrastructure, access to finance, and workforce skills can stunt private sector-led growth and job creation. To overcome these challenges to inclusive growth and jobs requires strategies and interventions that sequence and prioritize support for private sector development. Economic development achieved by enabling recovery and growth of the private sector is a sound strategy to address drivers of fragility and conflict and to complement state- and peace-building efforts. In fragile and conflict-affected states (FCS), vulnerabilities resulting from low per capita income and lack of employment opportunities may contribute to unrest and threaten stability. Inequitable and nontransparent distribution of economic benefits, such as revenue from extractive industries, can also fuel conflict. The private sector can drive economic growth and employment, but it faces specific challenges in FCS countries that hamper its development and add to the cost of doing business. Overcoming these challenges requires attention to the constraints to private sector activities and largely depends on the government's ability to provide a stable public sector environment and vital services. Based on World Bank enterprise surveys and an analysis of country case studies, the top constraints to developing the private sector are political instability, scarce electricity, corruption, and lack of access to finance, land, and transport. This brief, drawn from the evaluation World Bank Group Assistance to Low-Income Fragile and Conflict-Affected States by the Independent Evaluation Group (IEG), offers useful insights for practitioners who design or implement private sector development (PSD) strategies for FCS countries, including Bank Group staff, government officials, nongovernmental organizations, donors, and aid agencies. The IEG found that PSD as a primary vehicle for job creation has not borne results in the short run. The priority given by the Bank Group to investment climate reforms is necessary but insufficient for fostering longer-term growth and jobs in a high-risk environment. The evaluation's key insight for achieving successful engagement and inclusive growth and jobs in FCS is to "do things differently" by adapting assistance programs and instruments to the low capacity of governments and the informality of the private sector. 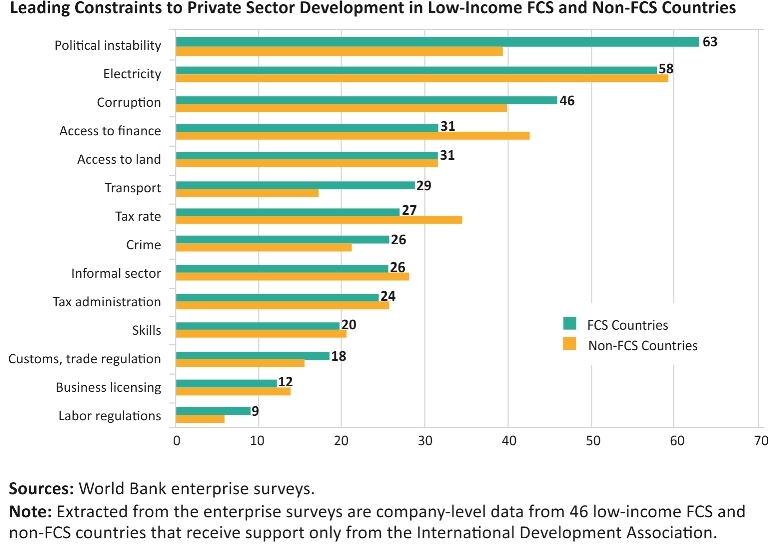 Low capacity at all levels characterizes FCS countries: governments often lack sufficient capacity to effectively implement and enforce laws and regulations; the private sector is largely informal and lacks business skills to enable rapid firm-level growth; and workers lack technical and professional skills limiting their employability. Devise a customized, sequenced strategy based on sound diagnostics of constraints and opportunities. Prioritize assistance programs with the emphasis and pace of support tailored to specific country conditions. Support and nurture local and foreign private sector activities to spur growth and jobs during all stages of reconstruction. Identify and use synergies and linkages across relevant actors, sectors, and interventions toward a cross-sectoral approach. Where appropriate, develop interventions targeted to migrants, migrant households, and diaspora communities. Compared with other nations, FCS countries on average exhibit lower economic growth and higher rates of people in extreme poverty. Their economies are more concentrated in extractive industries and agriculture with high shares of informal employment. Many jobs are informal- typified by subsistence farming, family hiring, and self-employment in micro and small enterprises in urban areas. Supporting private sector development requires support to both governments and the private sector. Governments play an important role in providing an enabling environment for PSD in FCS, they often lack the capacity to perform this role effectively. The private sector, comprising both local enterprises and foreign investment, can be remarkably resilient during conflict. However, sectors may erode or downscale, and jobs may become more informal because of conflict and the collapse of government services. Once foreign investment exits, perceptions of high risk and instability may linger. Attracting back foreign investment may take a long time. A sound strategy must address the structural distortions that arise from conflict and look to foster a legitimate private sector. Violence and conflict lead to deterioration in both trust and linkages between firms and in the infrastructure for accessing markets. While not all jobs affect social cohesion, those that shape social identity, build networks, and increase fairness, particularly for excluded groups, can help defuse tensions. Short-term jobs programs, such as public works, can contribute to social cohesion by facilitating demobilization of soldiers and expanding opportunities for excluded groups. However, these gains are not typically sustained in the medium or long term. Another challenge is the sectors driving economic growth - such as extractive industries or telecommunications - do not necessarily create many jobs. Human capital and infrastructure development, especially in the areas of electricity, transport, and water, are areas with strong linkages to PSD. Successful approaches combine sector reform with multi-donor financing for private power projects and capacity building for the relevant ministry, such as seen in Cameroon. The telecommunications sector attracts significant private investments even in high-risk areas. For example, from 2005 to 2013, mobile phone subscriptions in Afghanistan increased from 4 percent to 71 percent of the population. This sector has the potential to spur growth, entrepreneurship, and government service delivery. Many FCS economies depend heavily on extractive industries. The main benefit from natural resources industries is government revenue generation. A large volume of revenue, however, can have potentially negative impacts on the economy, such as Dutch disease. A top priority is building the capacity of governments to capture and manage revenues from extractive industries and to use them for sustainable development programs. For example, Eritrea, Guinea, and Liberia added community development regulations to their mining codes. Another crucial goal is leveraging the sector in ways that foster services and other industries aimed at increasing the spillover benefits for the local economy. Access to finance is another constraint to overcome, especially through establishing commercially oriented microfinance institutions and institutions that lend to small and medium enterprises. Early activities of the Bank Group in Afghanistan led to significant growth in the microfinance sector. Weak local banks can make capital infusions by development partners risky. Chances of success are enhanced when interventions combine financial support with technical assistance to help local financial institutions build capacity and meet international requirements. Scaling up investments in agriculture - the largest employment sector - is another priority. Areas for assistance include programs to connect farmers to local markets, upgrade rural roads, and improve productivity. The agricultural sector is more effective in reducing poverty among the poorest groups in rural areas because they are closely involved with agricultural production and gain directly and immediately from its growth. Formal registration of land is also an investment incentive. To be more effective, delivery of assistance programs should include proactive and ongoing implementation support in addition to financial support. Technical assistance and coaching can help build capacity among local firms and banks, and may help them increase their scale and productivity as well as meet international requirements and standards. Diagnostic-based strategy and prioritized assistance. No one-size-fits-all approach or set of policy and program instruments exists to foster inclusive growth and job creation in FCS countries. Analysis of the underlying causes of conflict or political instability and sources of growth and jobs, including informal and formal job opportunities, builds the foundation for a systematic strategy. Findings can pinpoint conditions for broad-based redevelopment and growth of the private sector -where institutions and infrastructure require strengthening, structural reforms need support, sectors offer development potential, and incentives can reduce risks. Support during all stages of reconstruction. Once donors can begin to engage in a fragile and conflict situation, a combination of short-, intermediate-, and long-term interventions can run in parallel with state- and peace-building activities. Short-term jobs can be created through demobilization, disarmament, and reintegration, public works, or community-driven development programs. Basic and professional skills development can lessen labor force constraints often characterized by youth with no formal education or training. Considering the needs and opportunities for the private sector early on, including around humanitarian relief and peace-building activities, can help strengthen local private sector capacity. Priorities and support programs will then shift to adapt to the evolving needs of the country for structural investments in vital infrastructure and dominant sectors. Care should be taken that public sector initiatives do not inhibit the recovery and growth of the private sector, encourage monopolistic structures, or foster corruption. Synergies and linkages. A long-term strategy can employ a range of approaches and implementation arrangements, local partnerships, and incentives and tools to manage higher risk interventions. Assistance programs that affect the private sector require effective coordination. They should take a cross-sectoral approach and exploit linkages, considering the needs of the private sector across relevant interventions in different sectors, such as in infrastructure development and human capital, including professional skills to enhance employability. Sequencing of interventions. Support can be sequenced in harmony with a timely diagnostic of urgent needs and constraints after conflict ends. Recovery may focus initially on emergency employment for high-risk and destitute groups; a shift to income-generating activities, private sector development, and microfinance; and finally the creation of a long-term enabling environment that encourages entrepreneurship and competition. These approaches can be pursued in parallel, but the emphasis and pace should reflect the country's conditions and needs. Investment climate reforms are critical to longer term growth prospects yet typically require much time to achieve tangible results in improving the business environment. Develop interventions targeted to special communities. International migration is another important livelihood strategy in many countries, especially when the local economy cannot provide enough jobs. In several FCS countries, migrants constitute a sizable proportion of the population living abroad, and remittances are greater than official development assistance or foreign direct investment. These trends highlight the need to effectively manage and leverage the inflow of financial resources and develop support services to meet the needs of migrant households. A policy framework and financial instruments can encourage inflows and productive investment. Inclusive economic growth and job creation interventions usually fall into two broad categories: policy and regulatory reforms aiming to improve the business environment and priority investments in infrastructure and dominant sectors. Support programs can exploit synergies and linkages among interventions with relevance to PSD across many different sectors. These include education activities that address employability, local economic development opportunities embedded in financing and natural resource management projects, infrastructure rehabilitation and development, and improvements to the long-term enabling environment for PSD by strengthening public sector governance. Useful insights for designing programs and interventions follow. Diagnosing the drivers of conflict and the constraints and opportunities for inclusive growth and jobs as the basis for a PSD strategy. Focusing on a few key priority issues to address major constraints, taking a cross-sectoral approach to tap synergies. Prioritizing investments around vital infrastructure, finance, and human capital and in dominant sectors such as agriculture and natural resources. Combining assistance programs with capacity building at all levels. Adapting assistance instruments to fit FCS contexts. Linking local skills development activities with private sector needs. Ensuring that interventions build on evidence and include metrics for measuring and evaluation. Are assistance programs combined with capacity building goals? Capacity building can be achieved through predictable, programmatic budget support complemented by technical assistance and investment lending. Technical assistance and coaching programs can help build capacity among local firms and banks as well as public sector agencies responsible for the business-enabling environment. Are risks carefully managed? Private investments in FCS are on average smaller and riskier than in other countries. Risks need to be carefully managed and mitigated. Mitigation tools include political risk insurance and catalytic investments by development partners. Are instruments adapted to FCS contexts? Given the cost structure, business model, and product mix of major development financiers, partnering with nimble organizations with field presence and local knowledge may be an effective way of providing assistance and building capacity. The World Development Report 2011: Conflict, Security, and Development looks at the challenges to less-developed countries posed by organized violence. A background paper from the World Development Report 2011 focuses on The Role of the Private Sector in Fragile and Conflict-Affected States. The World Development Report 2013: Jobs stresses the role of strong private sector led growth in creating jobs. The Donor Committee for Enterprise Development offers practitioners a comprehensive set of resources on PSD in conflict-affected environments.